As one of the leading providers of residential and commercial appraiser services in the Pearland market area, our certified appraisers can help you with valuations for both private and lending use. Our philosophy is to provide our clients with a fast, reliable and professional appraisal report that meets or exceeds their expectations and requirements for use. Not only do we complete our reports faster than most other appraisal companies, we maintain some of the lowest fees for appraisal services in the area. Whether you need a property value report for lending, private use or a legal matter, our appraisal services can accommodate most real estate valuation requirements. Whether you’re a homeowner or an industry professional, we take pride in deliver a friendly and reliable service. If you have any questions or you’re ready to place an order, simply call the number on this site or complete the appraisal request form found above. 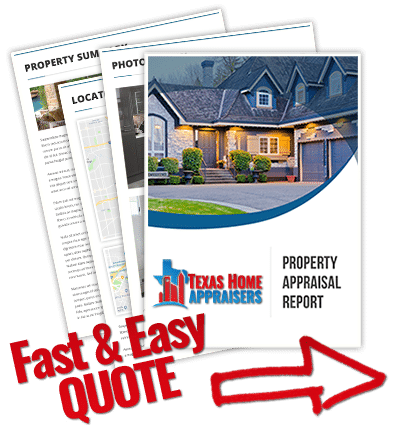 Do you need a professional appraisal service in Houston Texas right now? Give us a call or submit the web quote form and our staff help you right away. What does a real estate appraiser do? An appraiser is one who evaluates properties and market data to determine reasonable values based on various situations. Appraisers often work as consultants in residential and commercial markets where expert knowledge of the valuation process is required. How is a CMA different from an appraisal? Frankly, it’s apples and oranges. CMA’s usually contain a few recently sold and active comparable properties, and rely heavily on their prices. For residential property an appraiser will also rely heavily on comparable properties, but the level of research and adjustments to each sale are much more in depth. An appraisal report will consider land values, cost approaches and income approaches in the case of rentals. A CMA delivers a “ball park figure”, an appraisal delivers a defensible and carefully documented opinion of value. But the most significant factor is the person creating the report. Any Realtor can create a CMA without having competence within the market area or home valuation in general. Unlike agents, an appraiser must possess explicit market area knowledge when performing an appraisal. The appraisal is created by a state certified professional who makes a living out of valuing properties. How does an appraiser choose comparable sales (comps)? The first step to choosing comparable homes sales for the market approach to value is to view a list of all recently sold and actively listed homes based on defined parameters such as square footage, distance, lot size, age and more. Typically a comparison grid is used and adjustments are made to each of the comparable sales for major differences between the comparable and the subject property for such items as location, gross living or building area, lot size, condition/effective age, market conditions, degree of remodeling, construction quality and significant amenities. The purpose of the market approach is to use comparable sales, adjusted against the subject for differences, to determine a reasonable appraisal value for the subject property. What steps should an appraiser take when appraising my property? An appraiser should determine the scope of work, follow through with an inspection, and provide an opinion of value to the client. Real property includes the physical land and appurtenances affixed to the land such as a underground pools, a built-in gazebo, boat docks, and outdoor kitchens. Appraisers utilize many different forms of data to help them through the valuation process. The appraiser estimates the square footage (GLA – gross living area), by measuring the exterior of the home. It’s imperative that an appraiser accurately measures and takes out any non-living areas to ensure that the GLA is correct.